Apple Repair now charges $199 for a cracked XR screen out of warranty, and the whopping $399 for its broken glass back, so if you thought that the most affordable iPhone for the year will let you carry it around without a case, you may be sorely mistaken. There is no better way to add some elegance and pizzazz to the colorful iPhone XR than wrapping it a quality leather case that will feel natural to the hand and age gracefully. This is why we are rounding up some of the best leather wrappers you can get for the new iPhone XR you can get right now, and some of those even come in all the colors that you can get the XR in, including yellow, red, or blue. Case-mate needs no introduction as an accessory maker, and its Barely There leather series title explains it all. At just 2mm thick, it is, you guessed, a Barely There series case wrapped up in thin genuine leather. Thus, it is one of the sveltest of its kind around and offers not only easy access to all the ports and buttons but also has no problems with wireless chargers pushing electrons through them to top up the iPhone XR inside. Mujjo is has been covering iPhones with quality genuine leather cases for a while now, and the new XR now gets its turn to receive its first full-grain wrappers from the Dutch. Lined with Japanese microfiber to prevent abrasions, the cases fit like a glove and offer raised 1mm lip all around the phone for added protection. Besides the precise cutouts for all the ports, openings, sensors, and a cover for the buttons, Mujjo's leather cases maintain the classy look by eschewing plastic rings for, say, the camera and finger scanner openings. They have rather developed chamfered leather edges that slope seamlessly inwards. The cases are now fully wrapped in the premium material for a classier look, too. Now, off to the skinning itself. Mujjo uses vegetable-tanned leather which is waxed for added endurance, and the full-grain look leaves a remarkable impression, both in the eye of the beholder and in the palm. Mujjo promises that it "wears in with every use and acquires a beautiful patina and polish over time," and, judging from its similar cases for previous Phones, it has a point. 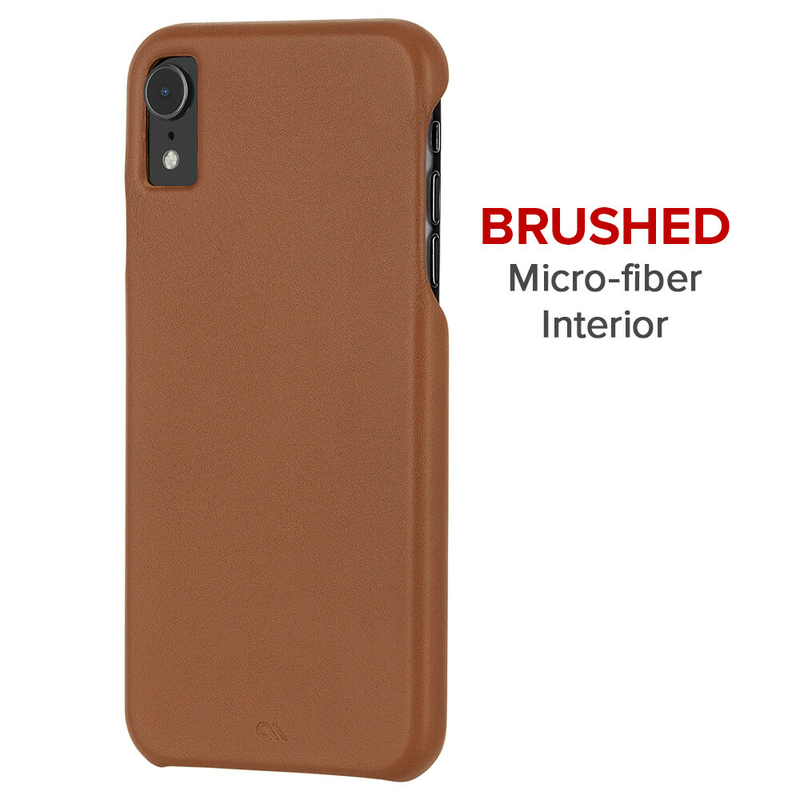 The full-grain leather cases for your iPhone XR start from $49.95, with worldwide shipping, or via authorized resellers. Hit the link if those pretty wrappers that come in Black, Olive or Tan, have piqued your interest. 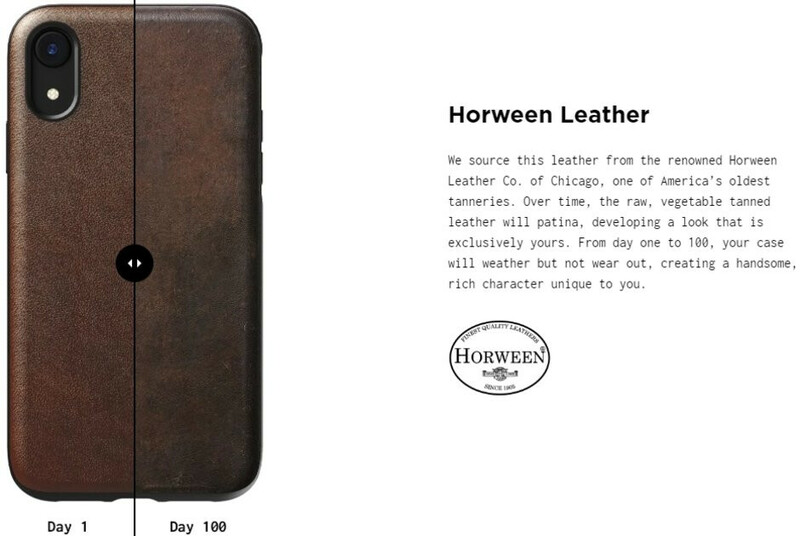 Have you heard of the famous Horween tanneries in Chicago? Neither did we, but when we dug up Nomad's claims that this is one of America's oldest tannery, and your Nomad leather case for the iPhone XR would develop crazy vintage patina over time, we were all ears. That's not only because of the premium leather material, but also since this year's edition is slimmer, and it has retained the 6-feet drop protection of its predecessors. Yep, the Nomad Rugged Leather Case for iPhone XR is drop-certified, so not only will your precious look good but stay safe in the process, too. The case is also available in black as a rugged folio and even comes in a tri-folio version, if you are so inclined. 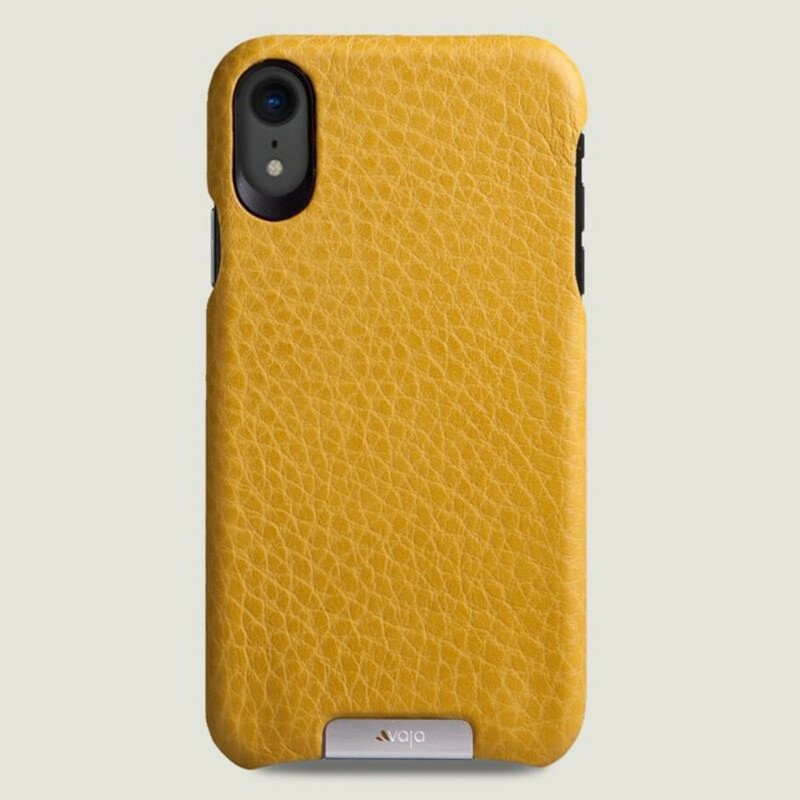 Now, the leather cases from Vaja don't come cheap, but not only are they high quality, but their basic Grip one here comes complete in all of the iPhone XR colors. Yep, there is one in red, blue, and even yellow leather to fit the respective hue of your iPhone XR. Red has proven extremely popular among those who pre-ordered, but the blue is not far behind, either. Our personal favorite, the yellow model, also has a respective Vaja Grip case to match. Tired of the expensive options above? Тhis Burkley classic lets you carry your iPhone XR in a leather case but protected with a rubber bumper of sorts for added grip and drop security. The genuine leather is handcrafted to receive this aged "Burnished Tan" look that will only get more vintage with age. The interior is made of suede, and with extra padding to prevent scratches and scuffs. This Burkley wrapper offers complete back and edge coverage, unlike most other leather cases in the category, and is compatible with your Qi wireless chargers for the iPhone XR.